I recently visited the headquarters and principal factory of Irizar. It is in the mountainous Basque region of Northern Spain, about 40 miles from the beautiful coastal city of San Sebastian. The highway climbs gradually through hilly terrain with higher mountains visible in the distance. On every flat piece of land there are either factories or houses, many of them apartments. It is a heavily industrialized area of Spain. Although Irizar can trace its history to 1889, it started to expand dramatically around 25 years ago; building the famous Century coach body on a variety of chassis from the main European manufacturers. Overseas factories were opened in Brazil, Mexico, Morocco and South Africa. There were also partnerships in China and India, but those were relinquished so that Irizar could concentrate on developing its high-quality premium range and image. Today, Irizar coaches are in service in around 90 countries. Around 2008, Irizar was feeling vulnerable in Europe as a bodybuilder on chassis. Some of its suppliers were competing directly with their own complete integral products, typically from countries like Turkey where labor costs were much lower. That led to a decision to develop and launch its own range of integral coaches that were first launched in 2011. The new range was introduced progressively in selected European markets. Engines were sourced from DAF, the Netherlands subsidiary of Paccar. Other key components of the driveline came from ZF. These are well-established units, with excellent parts and service support in all the main markets. At the factory, I met Gotzon Gómez, export sales director and Axier Etxezarreta, director Irizar USA. Gotzon said that the United States had long been of interest to Irizar and that they kept an eye on the market. The launch of the new integral range had been well received by European customers and that tempted Irizar to make a much more detailed study of the North American market. The company is already remarkably flexible. It builds a range of city, suburban and interurban buses and coaches, also high-deck and super-high-deck luxury coaches, on a wide variety of chassis and at various lengths and heights. Concurrently, the integral range has been extended for different applications, lengths and heights. On top of that, the company also had extensive experience of meeting the specific requirements of customers and regulations in many markets around the world. Etxezarreta is an engineer by discipline and said that the company soon realized that the i6 integral coach would need to be extensively re-engineered to meet US requirements. That meant specifying a Cummins ISX12 engine developing 425hp, coupled to an Allison B500 six-speed fully automatic gearbox. The drive axle is a US-made ZF unit. ZF was also chosen for the independent front suspension and steering tag axle. Irizar greater prefers this steering unit to a rigid trailing axle, because it gives longer tire life and better ride and handling. The stainless steel structure of the i6 was widened to 8 feet, 6 inches, an increase from the European legal maximum of 8 feet, 2.5 inches. The floor was modified to be completely flat with a floor-height washroom in the offside rear corner. Most European customers specify a washroom beneath the main floor, reached by steps which also serve a second exit door. This layout enables more seats to be specified. One standard length, 45 feet, was chosen, but with optional heights of 12 feet, 3 inches, and 12 feet, 10 inches. The front and rear overhangs were considerably shorter than European requirements, but facilitated enormous luggage capacity between the first and second axles. 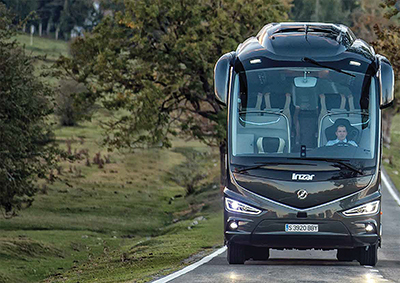 Irizar’s engineers modified the external styling of the i6 to incorporate divided windshields and heavy-duty front and rear fenders that were incorporated very neatly in the design. The rear view mirrors were modified to meet U.S. legislation and a whole host of electronic safety features were specified as standard. ABS prevents the wheels from locking when braking, while ASR prevents wheels on the drive axle from skidding in slippery road conditions. Those features are combined with an Electronic Stability Control system that is very clever. When ESC senses that the coach is about to carry out a manoeuver that is unsafe, such as taking a corner too rapidly, it can control the brakes on wheels individually to minimize the risk of going out of control. ECAS is a system that controls the suspension of the coach to provide stability, benefitting passenger safety and comfort. Finally, Lane Departure Warning system notifies the driver when the coach drifts out of its lane unintentionally. This can happen when a driver is too tired or is distracted. Irizar has an unusual legal structure. It is a co-operative and every one of the employees is a member. Each year that the company makes a profit, employees earn a dividend. This is an added incentive to working hard and meeting customer demands. Within the Irizar Group are a number of important subsidiaries who contribute to specifications. Hispacold is a leading manufacturer of heating, ventilation and air conditioning systems and they are not restricted to supplying only Irizar. 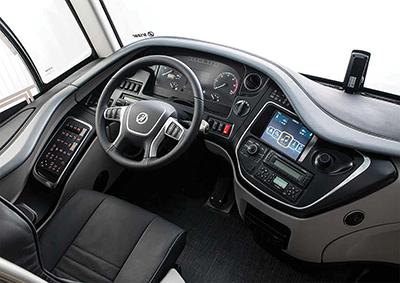 Masats makes a wide variety of coach and bus doors, while Datik has developed electronic safety systems to help drivers. Although a very high percentage of Irizar’s production consists of luxury coaches, the company also offers lower height interurban vehicles, including the option of models with their floor only one step above the ground in the front half, up to a point ahead of the rear axle. Irizar has also developed its own i2e all-electric city bus, with a full low-floor layout and an overall length of 40 feet. The company has proceeded cautiously, building up experience, but is now sufficiently confident about the future of all-electric buses that it has committed to a new production facility, closer to San Sebastian. Axier made a small diversion on our return journey so that we could see the progress being made with this factory. The structure had been completed and Irizar was about to start fitting out the plant so that it could build up to 500 electric buses per annum. The opening is likely to be in the spring of this year and by that time a 60-foot articulated model will be added to the range. Irizar also plans a shorter 35 foot electric bus which will be more manueverable in some congested European cities. Reverting to the US market, Axier was keen to emphasize that Irizar is fully committed to after sales support. The company has established workshop facilities in Dallas and Florida and finished 2016 with sales of around 20 units. He believed that 40 was a realistic target for 2017 and that the eventual aim should be 10 percent of a market estimated to be around 1,500 units per annum. Irizar had already committed $500,000 to a parts stock in Dallas. Irizar has unparalleled experience of developing markets and has previous experience of achieving similar targets. Their products hold good residual values and they have an excellent record of securing repeat orders. Etxezarreta said that this had already happened in the United States. The coaches had style and comfort that appealed to owners and passengers but they also had the security of good support. In his research, Etxezarreta reckoned that coaches in the United States had a life of around 20 years. That is probably a little higher than Western Europe, but in our case older coaches are quite often resold in Eastern Europe and selected African markets. Stainless steel structures are standard on the i6 integral coaches for the U.S. and that will be an important factor in achieving durability. Irizar North America plans to keep a small number of demonstration units which will be available for prospective customers to borrow and drive for a few days, to help them with the purchasing decision. 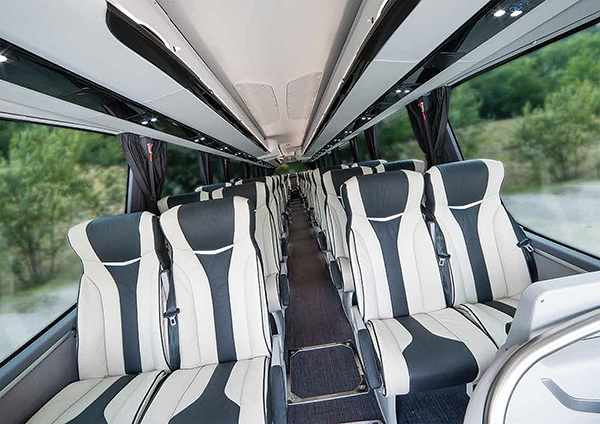 Irizar recognizes that a new coach is a major investment and similar demonstration programs have yielded good results in other markets. There are plans to bring prospective customers to the main factory in Spain. If you are one of the lucky ones, you will find it an unforgettable experience – not just the efficiency of the factory but the beauty and hospitality of the region. 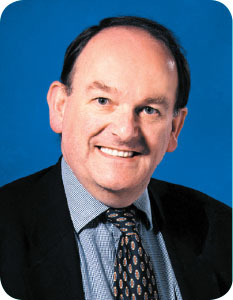 Doug Jack is with Transport Resources in the United Kingdom.